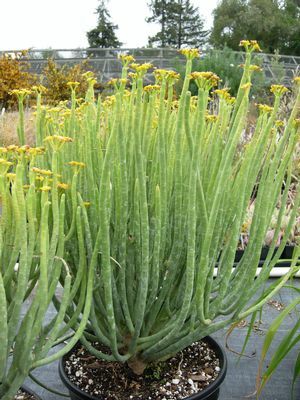 Euphorbia mauritanica was introduced into cultivation in Europe at or before the beginning of the 18th century. It was believed to have originated in 'Mauritanica' in northwest Africa. This is a rounded shrub, densely branched, usually growing to 3' (1 meter) high, sometimes up to 2 m in height and usually wider in diam. Branches are cylindrical, fleshy, marked with alternate leaf scars. Leaves are deciduous, crowded on the youngest branches. Inflorescences consist of a male cyathium surrounded by 5 to 7 bisexual cyathia on a short terminal branch. Glands 5-8, bright yellow. Pistillate flower exserted from the involucre on a curved pedicel. 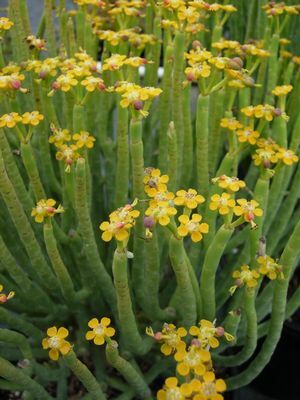 this is one of the most widespread species of Euphorbia in South Africa, but is especially dominant in the Northern Cape.